Sometimes the best creations come from spontaneity, from a random leap of faith. Such is the case with Toronto-based five-piece Jaunt. After meeting at a Halloween party, guitarists Pat O’Brien and Tom Helliwell stayed in touch online, sending each other song ideas and loosely working on tracks. Then, after a few years of digital jamming and sporadic chance encounters, O’Brien decided to arrange a gig and propel a group into action. “I decided to book us a show without even having formed a band,” O’Brien explains, “it turned out to be a good idea because we needed a keyboard player and my pal Dan [Reardon] just happened to play keys.” Bassist Duncan Hood and drummer Nick Nausbaum joined soon after and so Jaunt was born – “now we’re all pals”, O’Brien exclaims. Named after a passing remark made by O’Brien’s dad, a reference to a “leisurely jaunt” with friends, the band lives up to its carefree designation. 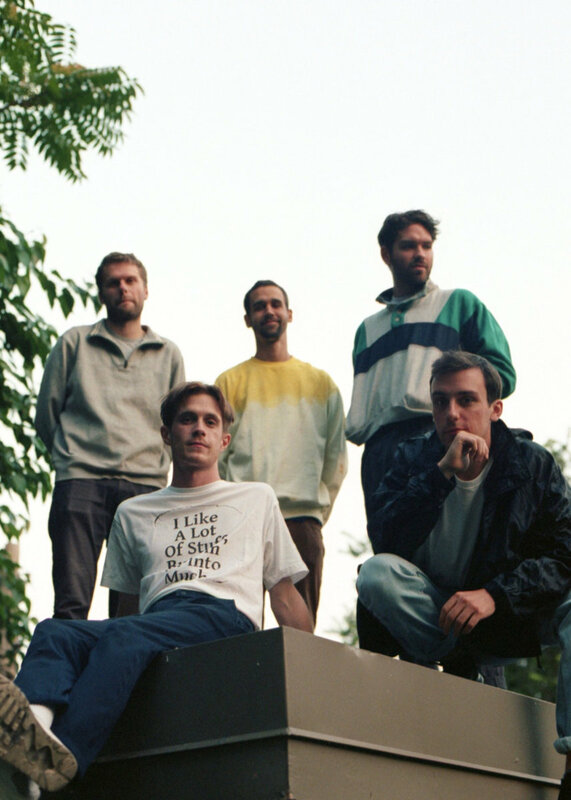 With an ear for infectious pop hooks, off-kilter melody and wavey, synth-laden guitars, Jaunt released their debut EP, ‘Chat’, in 2016 and made a name for themselves amongst the burgeoning Toronto scene, earning praise from the likes of fellow natives BadBadNotGood and Charlotte Day Wilson. As much as BBNG are influenced by jazz and hip-hop, Charlotte Day Wilson by soul and Daniel Caesar by R&B, Jaunt’s latest EP, ‘Cue’, plays like a combination of all these formative genres. Opener ‘Machined’ builds from a plaintive guitar melody into a sweeping soundscape informed by understated electronics and processed vocals – a gentle subversion of the pop aesthetic. While ‘Intimate Sunset’ plays like the mellow instrumentals of Suzanne Kraft and closing number ‘Cued’ flirts with ambience in its choral textures and lack of resolution. O’Brien and Helliwell take their digital beginnings into the studio with them, creating through a sense of improvisation and resulting in the varied nature of ‘Cue’. “The process can be very unstructured and open because you are simultaneously writing the song and recording it, enabling the song to dictate its own direction,” Helliwell says. Chords and melody are written over grooves and samples, resulting in “a collage-y nature to some of the song structures,” as Hood says. All blues and pink hues, the cover art for both EPs and recent single ‘Machined’ equally communicate a sense of human connection at one remove through mediated fabric and the screen. With EP launch shows planned for Toronto, Montreal and Hamilton, though, the group will soon be bringing back their live presence. “The act of playing with people and feeding off of a room’s energy is how we all fell in love with playing in this capacity in the first place,” Hood says, referencing their somewhat haphazard beginnings. Ultimately, ‘Cue’ might deal with the difficulty of communication or its attendant distancing but it is through the songs themselves that Jaunt connect with their audience, finding shared experience. With new music in the works, as well as the hope to play in the UK later in the year, “we’re cueing you up for what’s next”, O’Brien says.